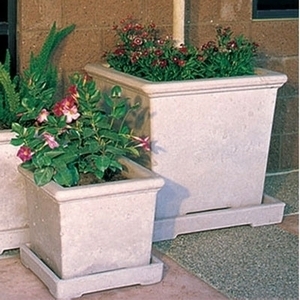 A perfect garden planter for any patio or landscape application, this square is slightly wider than tall. The tapered sides slope upward to a double rim with soft corners. Available in these 3 larges sizes each one will hold flowers, palms, trees and trailing ivy draping over the sides. Great as a group or stunning all by itself. Called classic because it's style goes with all decorating looks.